All bull markets come to an end, even the 35-year Great Bond Bull Market. The US Treasury 2-year yield crept up 3 basis points during the week, to 2.81% at the close on Friday, the highest since June 2008. In a month or two, as the fourth rate hike for 2018 and more rate hikes next year are getting further baked in, the 2-year yield will cross the 3% mark! Just two years ago, many soothsayers on Wall Street said this would never happen again – that the Fed, in fact, could never raise rates to this point. But here we are. For periods in 2006 and 2007, the 2-year yield was higher than the 10-year yield, and thus the yield curve was “inverted.” At the left end of the chart, denoting 2007, the line dipped below zero. 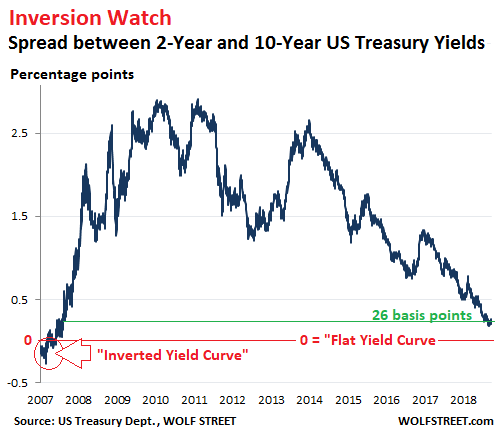 The Great Recession officially began in December 2007, by which time the yield curve was no longer inverted as the Fed had started cutting short-term rates. 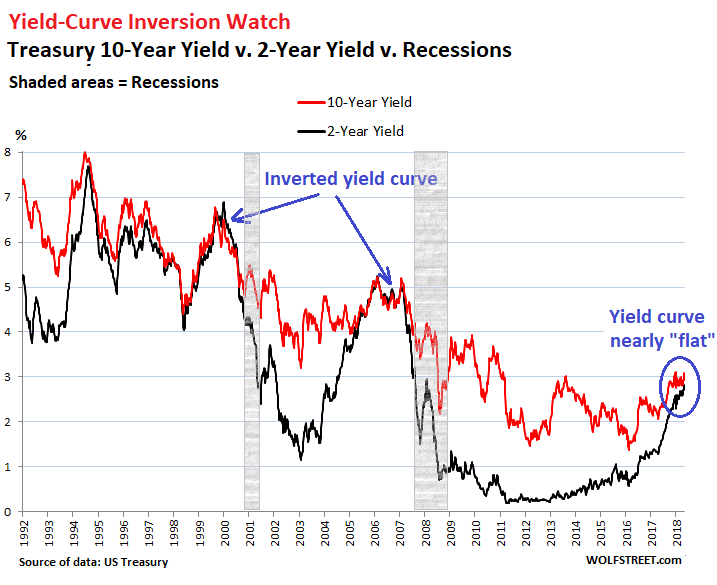 This scenario has played out repeatedly in past decades, when the “inverted yield curve” phenomenon was followed by recessions or worse. Inverted yield curves didn’t cause those recessions; but they were reliable predictors of them. Starting in 2008, the Fed imposed its yield-repression policy on the Treasury market, thus totally manipulating the market. But since December 2015, the Fed has been “gradually” stepping away from those methods of yield repression. So the yield curve is not showing free-market behavior; it’s showing the Fed’s manipulations, and the side-effects of the Fed’s backing away from these manipulations. There will be another recession. There always is at some point. A recession is an essential and necessary part of the normal business cycle. The only question is when – and the yield curve might no longer have a clue. During the prior rate-hike cycles, the Fed raised much faster, and it was much more difficult for the 10-year yield to move out of the way of the soaring and over-shooting 2-year yield. In this rate-hike cycle, the Fed is moving in slow-motion – everything is “gradual,” as the Fed has been ceaselessly pointing out – and the 10-year yield has a chance to keep limping ahead in spurts and starts. If you squint a little as you look at the chart above, you can see that the 2-year yield soared 4 percentage points (400 basis points) in the three years from June 2003 through June 2006. The third year in this rate hike cycle will be complete in December 2018. And the 2-year yield will have likely risen from 0.99% in December 2015 to a little over 3% by December 2018, so a touch over 2 percentage points – or about half the speed of the last rate-hike cycle! There is another thing to consider. The great bond bull-market started in October 1981. At the time, the 10-year yield peaked at just under 16%. Then yields fell (falling bond yields means rising bond prices). This bond bull market, with all its ups and downs, lasted till July 2016, when the 10-year yield bottomed out at 1.37%. During these 35 years, yields dropped during each recession as the Fed cut rates, but then yields didn’t return to prior highs. Instead they wobbled from lower lows to lower lows. And after each recession, their peaks remained lower than their peaks before the recession. But all bull markets come to an end, even the Great Bond Bull Market. And this dynamic of interest rates being lower after the recession than they’d been before it, in line with rates having fallen overall for 35 years, has likely fizzled, and rates overall won’t keep going lower. And those folks who expect that during the next recession, yields will fall below the low points in the past cycle will likely be disappointed. >And those folks who expect that during the next recession, yields will fall below the low points in the past cycle will likely be disappointed. No chance of negative rates? No, not in the US. The Fed saw what they did in euroland and said forget it. How about micro rates? Like 0.001? Think the FED will ever go for that? Just you wait ! In this topsy-turvy fiancial multiverse, I see ‘quantum’ rates streaming onto the events horizon. Nothing would surprise me anymore ..
Is it not virtually the same thing to set the rate at 0% and just “attempt” to a high rate of inflation? So 0% rates with inflation at 5% is basically negative rates. And you assume that the Fed has a clue what they are doing??? We are talking about some of the worst economic forecasters on the entire planet. Micro-incompetence has been banned from the fomc safe-space. The FED has done a great job of inventing the future and they’re well compensated for their hard work. The Federal Reserve is the tent pole of the global fiat system. They have to offer a positive interest rate; otherwise the Big Top collapses and the three-ring circus comes to a screeching halt. Not too much, though. Fed debt service is now 75 percent interest charges. They hike. They pay. Kind of like sharpening a knife to stab yourself. and when the economy is doing well it is rhetorical to add that the Fed would never do that, but when the system is crashing anything is possible. In the next “recession” money will be doled out in ever decreasing maturities? The Federal Reserve could stand the yield curve on its head but wont! The only long term debt will be fed controlled mortgages ? The Fed retires credit and holds the mortgages for profit? The Fed needs the income from maturing mortgages to replace what is being destroyed from the balance sheet destruction? Short term corporate credit NO bank loans! Or, after the next recession, yields just flatline to zero all across the curve and the global fiat Ponzi scheme collapses in on itself. I must be missing some part of the interest rate logic. The next financial crisis will likely be over to much debt. Unservesable debts. Most likely trillion$. If the dollar is created by creating debt, then when the debt Ponzi/pyramid collapses won’t there be a shortage of dollars. And if I have them, I sure won’t want to let anyone borrow them cheaply. Borrowers – corps, munis, EM gov’ts – refuse to offer higher Eurodollar market interest rates because they do not have sufficient USD cash flow to pay the coupons. Maybe rates rise a little, gradually but not absurd. So how might central banks respond? Corner the market for gov’t debt in order to manage both (i) interest rates and (ii) yields (perception of risk). Some credit analysts believe that the BOJ has already done this. Being able to ‘print’ a currency is helpful. BOJ can manage perception using the Yen. On the other hand, Turkey can’t print USD so managing the perception of Turkey’s risk level in Eurodollar markets is much harder to control. Notice how KSA scrambled to manage cash flow and contemplated Aramco IPO when FX reserves were depleting month over month sometime back. There’s an auction calendar for each type and maturity but the actual amount of debt issued varies from auction to auction. Is there a person/committee that decides that the next 7-year note will be $30B? Why $30B? What happens if the Treasury only manages to sell half the offering amount? The Treasury determines the amount needed in a specific maturity in order to fund the debt. At auction end they take all the competitive bids for 35% of the securities and determine the lowest bond price (not yield) and then acceptable competitive and all non-competitive bids gets securities at that price. US bond auctions are always oversubscribed and the bid to cover ratio tells how much. One man’s liability is another man’s asset. Just as another name for bond is debt, they are one and the same. The overwhelming amount of debt is mind boggling to all. Debt that for all sundry purposes, everyone knows will not be repaid. Most of this debt has bonds as its foundation. The global financial elites have interfered, meddled, experimented, manipulated, etc. – the bond market sector, to the extent that it is now broken beyond all valuation discovery recovery. Its a dead bond walking, just hasn’t fallen down yet. “If a free society cannot help the many that are poor, it cannot save the few who are rich”. Visions of a guillotine come to mind. The almost decade of cheap credit has caused so many bubbles there is a fear of a “bubble warp” crisis as in several bubbles crashing one after another. Hence the real reason why rates hikes have been going so slow. I mean for example if Spanish banks crash, Italian banks might crash next, and banks in Mexico might get affected… cue banking crisis! Of course that’s an extreme case but it may happen. Isn’t it interesting that, all these decades, we were always warned about the Domino Theory regarding communism (Henry Kissinger?) when, in fact, it’s the Domino Theory regarding **capitalism** we should have been concerned with? * Bonus ex-Warsaw Pact saying: Everything they said about communism was wrong; everything they said about capitalism was right. In one the last meetings of the Comecon, one attendee came out and announced: ‘the idea that there is a more efficient creator and distributor of goods than the market is dead’. And those capitalist computers come in handy, especially now that relentless competition has lowered the price to less than five percent of the starting point of the micro-computer revolution. Who is “they”? I’ll assume you mean the communists. Yes, they got it all wrong. So have we really been in a capitalist system for the last half century? Anyway, what did “they” say about all the freedom and material benefits of capitalism? How much of that did “they” get right or completely ignore? Capitalism is economici freedom, it is not government coerecion. The “Big Banks” aren’t doing it this time around. It is the big “Non banks,” like Blackstone, Blackrock, Ares, Apollo and all the private equity guys, along with hapless retail in ETFs that offer 12% yields that are “safe” because management is so good. The banks offer warehousing and clearing services, all secured by the lions, which haircuts that can be changed (and will be) with a phone call. Once the margin calls bleed a sufficient real haircut out of the various “players” the loans will be appropriated outright and balance sheeted at prices that make actual sense given covenants and coverage fundamentals as well as the continued FED backstop for depositories. This is the FED plan for “normalizing rates” (as Wolf points out they are going higher at some point along the curve and that will blow a 2T$ hole in the world) and, at the same time, making the structural changes to credit intermediation that will bring back relative financial stability by taking out the non-banks that exist outside the regulatory umbrella. Good riddance, the only sad part is that a lot of ignorant retail is going to get slapped and many retirees will be eating dog-food. Problem is America will probably see a depression before they ever see a recession again. Too early to call. I would still like to think that ECB and Italy are risks that can upset the rate hike apple cart. IMO, till ECB plays its cards the Fed will be on the rate hike trail. Also given that housing appears to be in the early stages of a downturn, how it will affect the markets remains to be seen. Right now, funds are gushing into the US so there are no visible cracks in the market due to the rate hike and thus the Fed is still on the job. If the market collapses due to EU risks or contagion risks (given the currency turmoil all over the world and the inter-connectedness today) then it would turn out to be a different story. True to an extent – as you have said the Fed may not do NIRP. But then ZIRP is always in play if markets take a turn for the worse. Also QE and yield-repression will come into play. Wolf: What is your take on the possible ECB impact? People concentrate too much on nominal interest rates. Real rates are more instructive (like GDP for example, which is almost never quoted in nominal terms). Real interest rates have been negative since the late 2000s crisis. It seems doubtful to me that the Fed will be able to raise real rates above the rate of inflation (CPI-U) and this reflects very poorly on the state of the otherwise robust economy we’re having. A truly solid economy should be able to support positive real interest rates for some time. A sign of the end of the industrial revolution in the West and the lack of need for significant capital formation. There is little ROI in a service/information economy. One leg of the three that will take us down. No productivity; likely negative productivity in developed economies and particularly US. Second leg is inflation. The only way to solve the problem we are in is continued and massive inflation of money system (dollar). Where are all these dollars going to go for return? Housing, stocks and bonds. Bond rates will be capped by this. Fed will continue to push up short term rates but this will be pushing on a string for longer term rates. 10 year won’t exceet 3% by much before major problems in economy. Long term, all long rates going much lower. Third leg is gold. US has been very successful with suppressing price of gold via monoply pricing on futures exchange. Gold represents the ONE asset that could blow the whole thing apart for a variety of reasons. But as long as the US and cronies can keep it down and out of sight, more and more inflation. This is a very good time to buy 10 years. Average up to 3.5% if it gets that high. That bond is not going much higher. If it does, then the whole economy will blow up. Longer term, all longer term rates are going to 0. No other possibility with inflation that is coming. How does the housing / real estate market fall into all of this? My opinion: The rate situation of today, real or nominal, is the result of substituting increasingly expensive energy with debt. The World was an oyster when we had the ability to do work with a return of 100:1 return on energy invested. Now, it ranges from 4:1 (marginal) to 20:1 conventional/established producers. The fact that Shale Oil companies have yet to make a dollar on what they produce says it all, “Let’s just make up for the poor return numbers with volume, and go into debt to do so”. It is the analogy of our times. To go back to M Power’s comment, this is not a solid economy. It is the little Dutch Boy sitting on the dyke economy, with ‘Experts’ madly trying to plug the leaks that never end. There is no more foundation to rest upon, just a lurching from one crisis to another, and every action produces unintended consequences in the search for a quick solution. The main effort of the day is to convince a wary public that someone knows what they are doing. People need to find their own solutions for what will occur as this unfolds. Real rates are negative and will stay that way indefinitely. I have news for you: the 2-year yield at (2.81%) is already higher than CPI (2.7%) and therefore the “real” 2-year yield is already positive. Any maturity longer than two years is also positive in real terms. The vast majority of outstanding Treasury securities now have positive “real” yield. Later this year, the 1-year yield (now 2.58%) will likely turn positive in terms of real yield. The 3-month yield will likely turn positive next year in term of real yield. Why do you not account taxes on interest income? Not all investments are in tax differed accounts. I will pay 37%+3.8% on the interest income, no State tax for Treasuries, therefore my real return is 1.66%, well below CPI. I find it frustrating that real world returns are not taken into account in the analysis of how much we are losing to inflation. 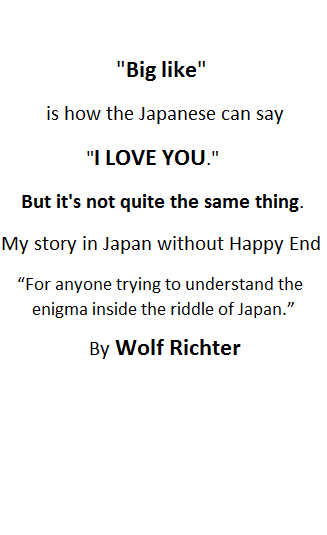 BTW, I really enjoy your writings, thanks for all the effort you clearly put into them. The issue of paying income taxes applies to all income, and Treasuries are no different, except that they have tax-free status under state tax laws (a benefit). Stock market performance isn’t measured in after-tax metrics either (deduct 37% plus state income taxes). “real” yield and “real” stock-market returns are well defined: returns minus rate of CPI changes. I echo Earplugs’ concern: bonds and money-market funds will remain a net loss to investors until real after-tax returns exceed inflation. More subtly, shorter-term bonds are also a net loss to a healthy fraction of pension beneficiaries, those whose benefit payouts are indexed to inflation (and then taxed). Just to be clear, business cycles aren’t ‘normal.’ They are what happens when central banks are granted a government-enforced monopoly on bank-note issue. No, the other way around. Business cycles existed long before there were central banks. Central banks came along in part to prevent the business cycles from happening, without much success, as we have seen. That’s the lie they use to get away with it. See “The History of Money and Banking in the United States,” by Murray Rothbard (and the works of the Austrians in general). Business cycles are as old as business itself. They’re part of it. I have a shocker for you: the business cycle precedes not just the existence of the Fed, it precedes the existence of the US. Only the peaks have names, the troughs, usually due to bad harvests were too common to name. See the South Sea Bubble in England, the Mississippi Bubble in France and the grandfather, the Tulip Bulb craze in Holland. After Spain conquered the Aztecs etc. a flood of gold and silver entered the country producing a temporary burst of prosperity. But this was largely spent on English and French wares, producing little local industry. When the veins ran out, it turned into a bust. There were plenty of booms and deep, deep busts in the 19th century prior to the creation of central banks like the Fed. Many commenters here like to drone on about central bank incompetence, but the length of the average business cycle has gotten longer as the decades have gone by. Presumably with experience, the Fed is getting better at fulfilling their mandate. And it may still be better to have someone trying to keep the car running at a constant speed by pushing the gas and brake pedals as needed, than go back a situation where no one is behind the wheel. Absolutely on the past business cycles. People get fixated on the past, but never look at the data on business cycles, say in the 1800s. The US spent much more time in recession then than now. That doesn’t mean I am a fan of the Fed. It’s a case of picking your poison. I’ll pick the modern version. Sheila Bair and Brooksley Born saw a lot of this coming, made their case , were literally laughed at. We are seeing the results of the thousands of economist PhDs, too big to fail banks, political garbage, etc., being cooked up in the big pot. I saw the bubbles forming in 1996. It’s 22 years later and we are still reaping the consequences- multiple bull and deep bear cycles. The lie is that economic booms and bust are an inherent part of “business itself” as you put it. Economic booms and the inevitable busts are always the result of artificial credit expansion in one form or another. The artificial credit makes certain investments more attractive than they otherwise would be given an honest interest rate produced by the market itself. The panics/depressions/recessions that results is the market discovery of exactly that malinvestment. In my mind, a stable business is one that modeled after the old shopkeeper of the past. The shopkeeper set prices every year to employ workers at a fair wage to keep them living in comfort and happy. The shopkeeper collected a fair wage to keep himself and family at a fair level. Growth was set at the prevailing inflation rate. Today, Wall Street drives everything. If a company has been stable with rising profits matching inflation, they are a failure. The requirement of business today is to grow at double digit rates above inflation or their stock is punished. To do this, the pressure for companies to do more with less people and lower wages to drive up “quarterly growth” numbers is tremendous. This causes instability. One bad quarter and the company may lay off a massive amount of people. In order for growth, the longer term employees with higher pay will have to be replaced with new employees who will accept less. Have wages really stagnated since the 1970’s or have the higher paid employees been pushed out for lower paid employees? The term I’ve heard is “The race to the bottom”. Nothing left to debate here. Study the history of business going back to ancient times to find out about the business cycle — that’s all I can say. The historical record is clear: credit and the business cycle existed long before the invention of central banking – very long before – the history of interest rates dates at least to Babylon, and the business cycle is described in the Book of Genesis, when most business was related to agriculture (“seven lean years”). The problem with low rates is that asset prices increase. This we know for a fact. People reach for yield. There comes a point where asset prices are so high, not even interest rate reductions will inflate them anymore. And when asset prices stop increasing, that’s when the economy starts tipping. Asset prices rarely stabilize at a high level or plateau. The charts show you this. Plus, it’s the growth in asset prices that has been feeding the economy. Take away that growth, and the economy will fall. The FED knows this Bobber, and the good news is they actually have a plan of sorts that will deal with some of it. If interest on the deficit rises to the point that it can’t be financed then the Gov. will have to stop wasting taxpayers money. We may finally reach the point of no return. Some states are already there. I hope Powell’s intention beyond helping savers is to pressure Congress to reform its insane spending. Tom, the Federal Government can run deficits unlike state governments. The USA cannot go bankrupt because the Fed government can create fiat money with no limits. We are off the gold standard economics. States cannot create fiat they need tax revenue and must balance budgets. The Fed government can create fiat, sell bonds (US Treauries) or collect taxes. And the idea of nobody will buys our bonds and we are in trouble is nonsense. The central banks of the world will buy them because they need safe liquid collateral as well as the big banks. The economy will be bigger and better with more Fed government spending as Fed government’s debt is somebody elses income. Austerity kills an economy. The Fed should be able to induce some inflation by raising rates, the massive expansion of credit is deflationary, and so far that overwhelms their efforts. Raising rates does not lower inflation in a service economy. Banks can charge more why would they? Home buyers may put their down payment in a bond and use the interest to pay off the mortgage interest and probably collateralize the bond. (coupon clipping) I am really not worried about this, the problem is the massive tsunami on new government debt and a Congress fundamentally opposed to the expansion of government. Never bet on amnesia. Can you expand on your comments? Raising rates does not combat inflation in a service economy? Why? How is the massive expansion of credit deflationary? The service economy is tied directly to short term borrowing costs. CPI is still in an uptrend when does the magic begin? The expansion of debt (decades) has made money worth less and PMs more valuable. Ten years ago Wayne Angell, Fed governor, called out the farce that raising rates curbs inflation. If anything it causes more of it. Rates and inflation correlate??? Stay on the Treasuries short-end and stagger and roll catching flash crashes flight to safety in the near term? Wait a second. There will be another recession? All bull markets come to an end? What? How can that be possible? That happened in the distant past but that can’t happen now. The Gods of the Federal reserve watch over us and protect us from recessions and bear markets. There will never be another recession or bear market in my lifetime. Is the world converging on Japan (central bank buys most bond issuance, rates and yields are actively managed by a not-so-independent central bank, rates and yields are held near 0) or not? On second thought, it looks like there’s a zero missing. Should be $1,000,000 in earnest money. SWOT just asks to be spelt with an Ø, and that is opportunity cost staring at you, and a reason that zero keys often look so worn. Market a keyboard with only zeros, and one one. It’s a career piece designed for any and every budding banker, so he or she can hold the kind of conversation that will earn the respect of every superior. Trump when asked where the money would come from said ” just turn on the presses”. Folks inflation is coming and rates are going much higher. Short yield meeting long just says the market has reached saturation point, the spread it crosses to do that is not directly relevant in the most basic sense. The tendency is for short and long yield to then rise in parrallel once they meet, if rate increases are what are chosen. Rates can be forced or allowed to whatever level, even less sophisticated countries manage that with ease, the point that you are dicussing though is if this is really possible without upsetting the domestic economy, society, or the international balance…personally I would not want to guess at those or even try to relativise financial engineering with what the effect will be on your neighbours choice of breakfast. People will have their ideas though, based on how they see changes affecting their own world, and Americans will not enjoy being looked on as a country which is due to fit in to the same economic rules non reserve currency nations are subject to. does some explaining on US net international positions. The short of it is that the US position is only tenable while other countries accept payment in US debt, that is to say they hold treasuries as reserves, or put another way – use the dollar as account. If you look at recent charts, foreign buyers have tapered off to flat holdings of the ever expanding US issuance . It could be by agreement or in competition. As calculating the whole international fiat system is like asking how long a piece of string is, I think we are just left to guess what anything adds up to now, but the trend to either supra national synthesis or post globalist spending/socialism are sort of classic replies, not forgetting pax imperia where success is made relative to the result imposed on those countries that do not quite know how to tow the line. If that actually clarifies it all for anyone then it is probably due to lack of detail. They already are to a smaller extent, with more moves planned in that direction. What happens is that the structure of trade changes in their favour, often they integrate resources, diplomaticy also – they build their own common interests. This necessarily will close out some access to the US (and its closest partners i.e. UK) , which need not be a bad thing at all if viewed constructively. The Anglo powers like to have the board arranged a certain way that benefits their necessities, that gives them priority, also questionably for defence . This is normal, some of the position is well earned, some isn’t. That explains the basis for modern geopolitics quite well, and the Anglo world, the US as active superpower, are quite intent on maintaining if not expanding their footprint of alliance and influence outside of straightforward open trade. The picture becomes very confused at that point if you are trying to understand it, because history, politics, culture and so on are brought into the equation as dominant facets, are often used to overide common sense explanations which various states ( not just the US) would prefer not aired. I could not say if Anglo endeavour is a lost cause or the future, but certainly it is chaotic, morphing and redirecting itself endlessly as per what the world presents, or what new ambitions are created. This is polarising the world again to a certain degree, but this time it is not so much along cold war lines, but those who choose to steer away from US hegemony and those that accept it. Various countries have become very wary of how western enterprise works, or what it brings. You can add to all that that there are resource limits in the world, a reality that will stump even the most well intentioned planners, and one that in future will cause some very major shifts in attitude and position. If you compare the patterns of movement in the 10 and 2 year Treasuries over the past 20 years, you can see that they’re roughly in sync until 2012, after which they each seem to move independently (rising for the 2 year and more or less flat for the 10 year). Why is that? Do you think they will return to being roughly in sync again? Also, in your second chart I note that in the period just prior to the last two recessions, the 10 year yield seemed to bounce up against a resistance in both cases. And I note that this appears happening again right now. Do you think that is significant? And finally, you note that in the past 35 years after each recession, the yields failed to return to prior highs. Why do you think that is happening? Great questions. I’ll give them a shot. The 2-year reacts very quickly to Fed rate hikes, and overshoots at the end of the rate-hike cycle — which is part of why it tends to be higher than the 10-year toward the end of the rate-hike cycle (“inverted yield curve”). The 10-year yield doesn’t react immediately and not as much to Fed rate hikes; hence its smaller moves and more resistance in both directions, as you can see in the chart. I think part of why — no one “knows why” the market does anything… so just guessing here — there was more of a divergence since 2010 was the Fed’s ZIRP. There was just no appetite among investors for a long time to commit funds for 10 years at these very low yields. The 2-year yield was in the 0.25% range. And to lock in, say, 1.5% for 10 years when inflation is almost always higher than that is very unappetizing. And there was a lot of resistance going this low. It took about 8 years of yield repression before investors got knuckled under enough to where they bought 10-year maturities at a yield of 1.4% in Jul 2016. I think – zero proof on this – that the negative-interest-rate policies in Europe started sending Eurozone investors toward the 10-year starting in 2015, and that this was the reason why the 10-year ever got as low as 1.4%. Otherwise I think it might have bottomed out at around 2.5%. This would have made the chart from 2012-2015 look a little more like prior periods. And yes, I think this period is over, and we’ll be seeing the 2-year and the 10-year move more in “sync again,” as you said. The resistance you’re seeing in the 10-year yield also has a lot to do with the 10-year horizon. If you buy a 10-year maturity today, you would want to price in the events of the next 10 years: How much inflation? When is the next recession? When will the Fed cut rates again, and what will those rates look afterwards, etc. Unless people see some huge spike in inflation, once the yield on the 10-year gets high enough, it becomes very attractive over a 10-year horizon, and a huge amount of buying sets in. If you can lock in 5% risk free for 10 years, and you assume that there will be a recession along the way, and that rates will be cut in a few years, it’s just an irresistible deal. This will happen again. It already happened at 3%. The next big resistance level may be around 4%. And I seriously doubt the 10-year yield will go over 5% because there will be massive buying, from around the globe. This is what forms the resistance that you noted in the chart. Concerning your last question: Inflation peaked in 1981 at about 15%. Inflation is a killer for bonds with long maturities because they lose so much of their purchasing power. So investors demand to be compensated with higher yields. This determined bond yields with long maturities. As the Fed got inflation to diminish over the decades, the bond market gradually started believing that the Fed would be able to keep inflation low in the future, and thus demanded less compensation for taking on the risk of future inflation. This faith peaked during the fake “deflation” scare in 2016. So in effect we saw 35 years of gradually growing faith by the bond market that the Fed would be able to push down inflation and keep it low. This dynamic created the now-ended 35-year bond bull market. The entire financial system is circling the drain which explains why the Phillips Curve is broken. Interest rates have to rise at a consistent rate forward or we will be back to square one with QE Infinity until the cows come home and Japan’s lost decades will be the same for the USA.